There are six lines in the diagram, on each of which are three of the nodes. 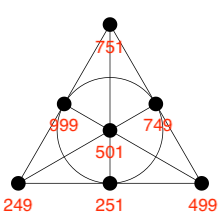 On each of those lines, the result of multiplying the numbers on those nodes should end in 001. The same thing for the circle, on which are also three of the nodes. using a brute-force computer program; there aren't that many 'degrees of freedom'. Once you have chosen a value for three points not on a line (e.g. 249, 251 and 501), the rest are uniquely determined and you can just check whether all products end in 001.